Lowers fence cost by extending post spacing. Suitable for multi-wire sheep, goat and cattle electric fence applications supported by wood, steel and Gallagher Insulated Line Posts. 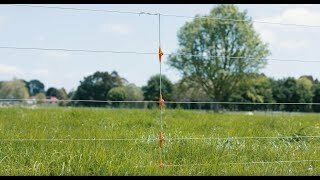 Lower fencing costs - Electric fence droppers maintain wire spacing, reducing the number of posts required in a fence line. Superior insulation - Wire attachment points are all electrically isolated from one another to allow for earth return systems and minimise faults. High strength, secure wire attachment - Glass-filled polypropylene insulation secures wires in correct position for reliable wire attachment. Multiple wire spacing options - Pre-formed wire attachment locations for 5 or 6 wire fence spacings for sheep, goat or cattle wire heights. Long life - High quality galvanised steel and UV protected glass reinforced polypropylene, backed by a 10 year warranty.